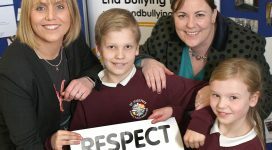 Northern Ireland Anti-Bullying Forum (NIABF) is the lead on anti-bullying policy and practice in Northern Ireland. 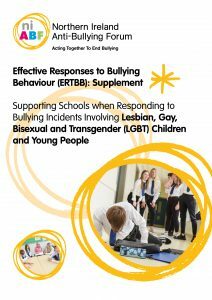 These new supplements have been created by NIABF and should be read in conjunction with Effective Responses to Bullying Behaviour. 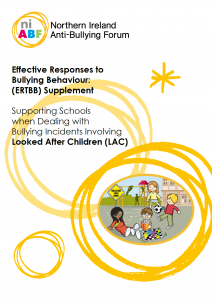 The supplements will support schools when dealing with incidents of disablist bullying and dealing with incidents of bullying involving Looked After Children (LAC). 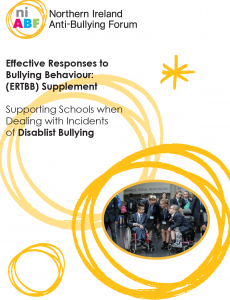 The guidance focuses on the considerations which staff should bear in mind when addressing incidents of disablist bullying behaviour, whether the child is experiencing bullying behaviour, displaying bullying behaviour or witnessing bullying behaviour. The guidance focuses on the considerations which staff need to bear in mind when addressing incidents of bullying behaviour involving a looked after child in any capacity. This could be whether the child is experiencing bullying behaviour, displaying bullying behaviour or witnessing bullying behaviour. This document focuses on the considerations which staff need to bear in mind when addressing incidents of bullying behaviour involving an LGBT child or young person (or one who is perceived to be LGBT) in any capacity. This may include a child that is experiencing bullying behaviour or a child who is displaying bullying behaviour.